Immediately after the Space Infrared Telescope Facility launches in January 2003, mission planners anticipate a four-hour communication gap when their tracking system won't be able to "talk to" the observatory. This could be a nerve-wracking time for those who've worked so hard on the mission, an infrared telescope that will study the early universe, old galaxies and forming stars, and detect dust disks around stars where planets may be forming. The solution to their problem lies within the Council for Scientific and Industrial Research Satellite Applications Center, a satellite tracking facility in South Africa formerly used by NASA. Located in Hartebeesthoek, 60 kilometers (37 miles) north of Johannesburg, the Satellite Applications Center will track the Space Infrared Telescope Facility for up to 4 hours, or until the Deep Space Network's tracking station near Madrid, Spain, acquires a signal. 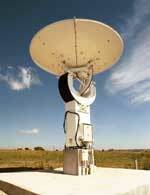 The Satellite Applications Center has been managed by South Africa's Council for Scientific and Industrial Research since 1958. From 1960 to 1975, it was known as the "Joburg Minitrack Station" and became part of NASA's worldwide scientific satellite tracking and telemetry network, operated by NASA's Goddard Space Flight Center in Greenbelt, Md. It then became part of the French National Space Agency (le Centre National d'Etudes Spatiales) worldwide tracking network. Since 1989, it has been a program within the South African Council for Scientific and Industrial Research's Information, Communications and Technology division.